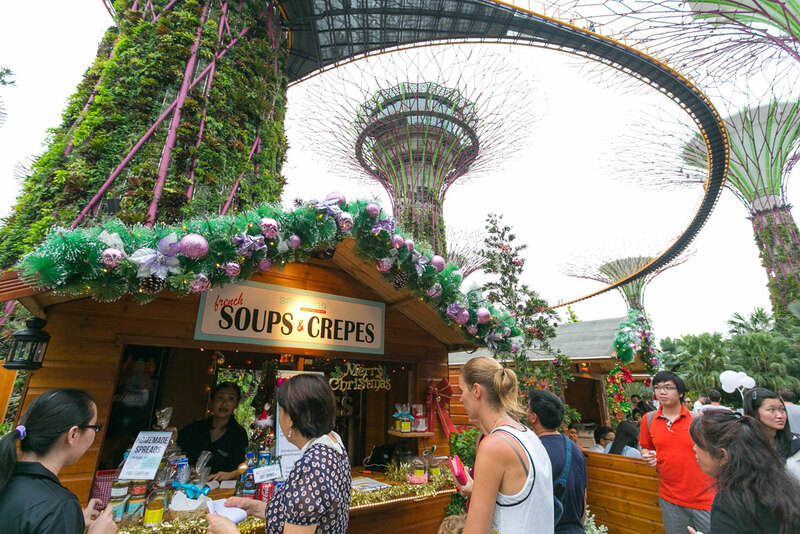 Christmas Wonderland, Singapore’s biggest yuletide fair, was created to enthral visitors with a combination of magnificent sculptures of light and charming festive markets alongside carnival games. This year, it will open to public from 27 November to 27 December 2015, from 4pm to 12 midnight daily. Back for its second year, Christmas Wonderland at Gardens by the Bay 2015 spans 35,000 square metres, across four main areas: the magnificent Luminarie light sculptures which begin at the Golden Garden and extend throughout the festival site; the Festive Market at the Supertree Grove; the Fairground near The Meadow; and the Christmas Toyland floral display in the Flower Dome. 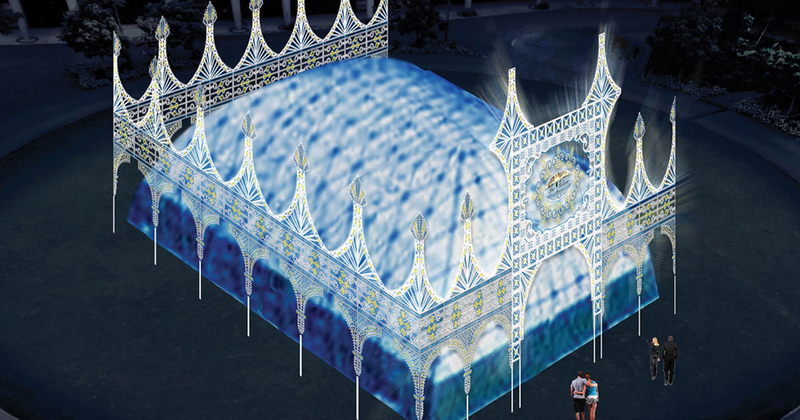 Lending a festive air to the Gardens, the magnificent Luminarie light sculptures, delicately handmade by Italian skilled craftsmen using white wood from the south of Italy, will feature an all-new architectural design reminiscent of the medieval period. 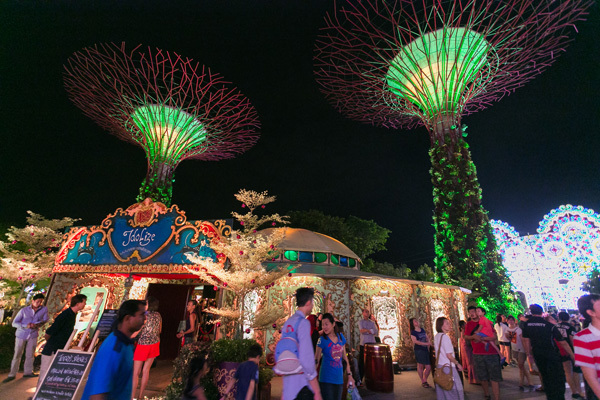 As many as 56 enchanting sculptures – the tallest towering over 20 metres – will nestle amidst the greenery within the Supertree Grove, Dragonfly Bridge and Flower Dome. Not to be missed is the majestic 20.5-metres high and 24-metres wide Spalliera that will frame the Cassa Armonica gazebo at the Supertree Grove, providing a stunning backdrop for the Christmas Carols and Yuletide sessions, as well as the crowd-favourite Blizzard Time, that will take place here. 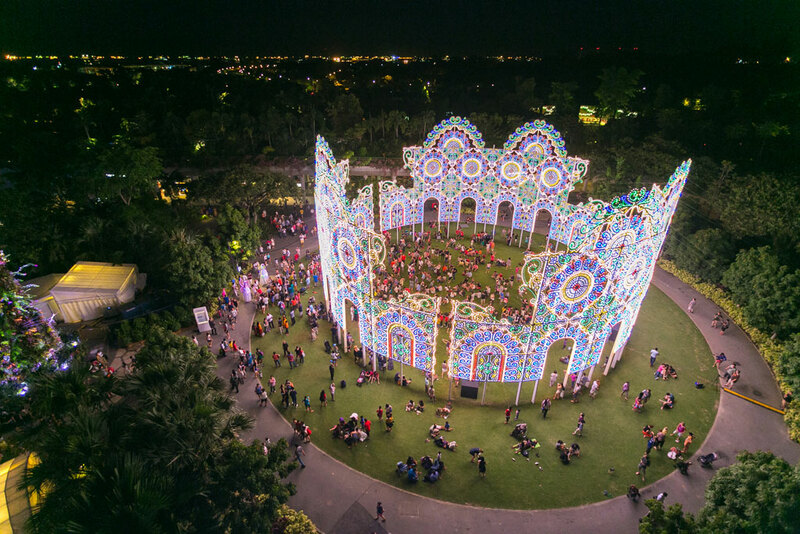 The Luminarie are on display from 27 November 2015 to 3 January 2016, 7:00PM to 12:00AM daily. The ornate century-old Spiegeltent or “Mirror Tent” is a large travelling tent constructed in wood and canvas complete with brocade draperies, stained glass and beautifully handcarved artwork. This 6-metre high and 18-metre wide tent comes in 1000 pieces, which are expertly assembled in just 2 days! Originally built in the late 19th and early 20th century, only a handful of them remain in existence and are used as a feature attraction at various festivals around the world. Dine at the spectacular Spiegeltent for a unique culinary experience and savour a range of food and beverage options specially curated by Harry’s. Mondays to Sundays: Dinner from 4:00PM to 11:00pm (Last order at 10:30PM). Saturdays, Sundays, Christmas Eve and Christmas: Brunch from 10:30AM to 3:00PM. The Spiegeltent will be closed for dinner service on 27 Nov, 3, 10, 15 and 17 Dec for private events. Making its debut at the festival this year, step into the Ice Palace, a 20.3-metre wide indoor chamber that delivers an arctic experience sure to be enjoyed for both the young and old. 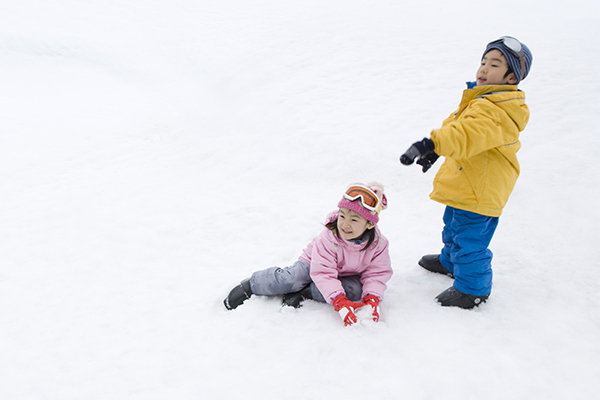 Bundle up and play at the Snow Playground, or don your skates and glide around the Ice Skating Rink. The Ice Palace is open from 27 November 2015 to 27 December 2015, 4:00PM to 11:00PM daily. Tokens must be purchased for the Snow Playground and Ice Skating Rink attractions. Token booths are located around the event site. Socks are available at an additional cost of $2 each and gloves are available at an additional cost of $4 each. Christmas just wouldn’t be complete without a visit to Santa! 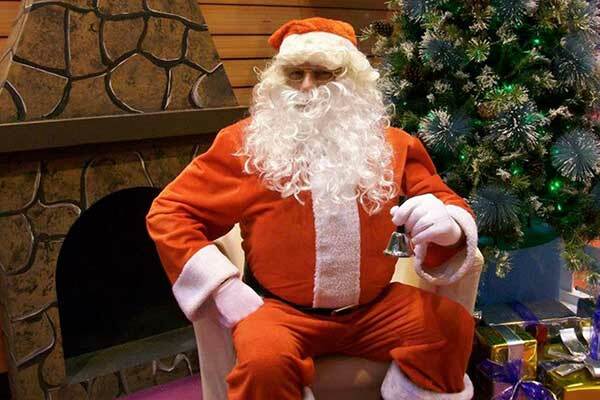 Here’s a chance for little ones to meet Santa Claus and tell him their dearest wish. Come to the Santa’s Cottage and have a memorable photo-taking moment with Santa. Charges apply for photo-taking sessions. Visit Santa at his Cottage from Thursdays to Sundays, 5:00PM – 10:00PM. A brand-new Christmas Toyland floral display blooms in the coolness of the Flower Dome. This year, toys reign supreme amidst yuletide floral favourites like the poinsettia, Christmas rose, winter heather and holly. Towering over the enchanting floral display is the centerpiece of Christmas Toyland – an 11-metre tall Christmas Pyramid decked with toys. This multi-tiered traditional German wooden carousel will transform into a ‘live’ stage, hosting a series of festive performances for the very first time in the Flower Field. 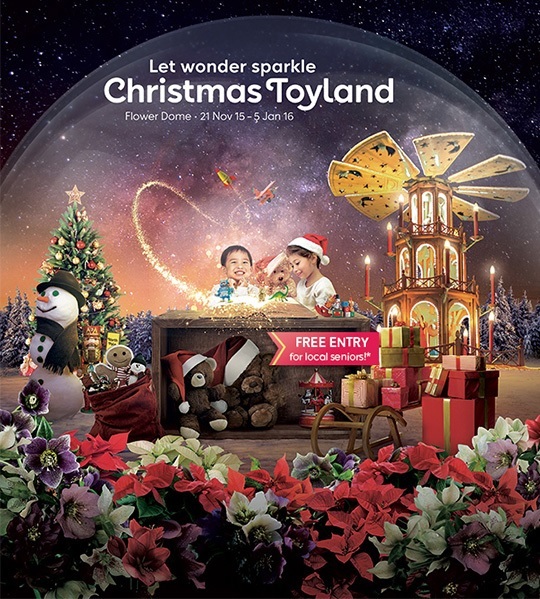 The Christmas Toyland is on display at the Flower Dome from 21 November 2015 to 5 January 2016, 9:00AM to 9:00PM daily. Conservatory charges apply. For more details, please visit Gardens by the Bay. Visit the AIA TrickArt and let your imagination run wild with the original 3D optical mirror-illusion! Snap a picture at the AIA TrickArt with your family and friends, and use the photos as personalised Christmas e-greetings for this festive season! What’s more, AIA gives you MORE reasons for having real moments of joy with your family this Christmas. 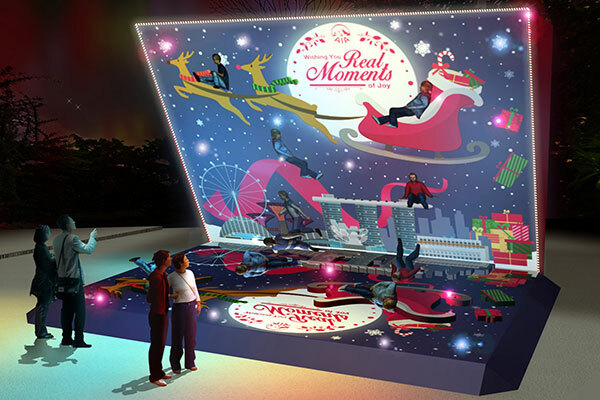 Simply share your photos on Instagram with the hashtags #AIARealLife, #RealMomentsofJoy and #ChristmasWonderlandSG to stand a chance to win the GRAND PRIZE of a 3D2N Family Stay at the Festive Hotel @Resorts World Sentosa and many more! Contest ends 31 December 2015. Featuring all-time favourites from Christmas fairs around Europe, these Carnival Rides, including some never before seen in Singapore, will certainly delight the little ones. What’s a Christmas fairground without the vintage Carousel! 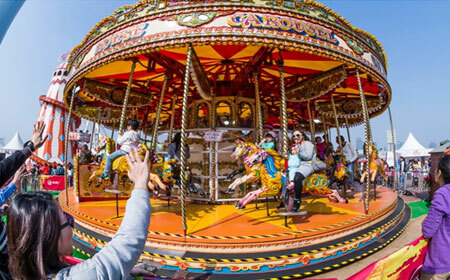 The Carousel has become an ultimate fairground icon that is as recognisable today as it was in Victorian times. During the late 1800s and early 1900s, the British fairground was the most fantastic cocktail of cutting-edge engineering; the flair of the artist, the skill of the carver and the achievements of European organ builders – and the Carousel was at the heart of this, with all the elements coming together. Be sure to have a ride on the iconic British funfair attraction, suitable for all the family. 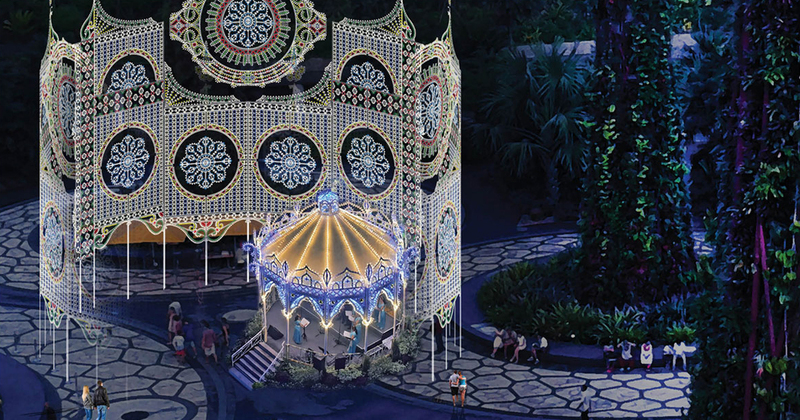 Tokens must be purchased from Token Booths around the event site for the Carousel ride. 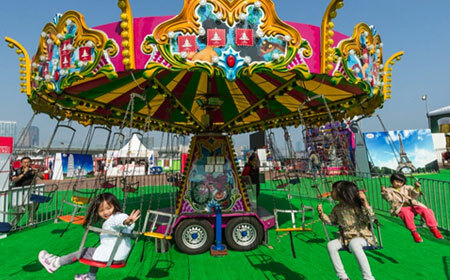 Take a gentle spin and feel the wind breeze through your hair in this child-friendly Swinging Chairs ride. Tokens must be purchased from Token Booths around the event site for the Swinging Chairs ride. Never before seen in Singapore, let your child play merrily on the Helter Skelter, another iconic attraction in Christmas fairs around Europe. The word Helter-Skelter literarily means ‘hurried and confused’, ‘in haste’ or ‘disorderly’ and the lighthouse-like structure with a high spiral slide offers you more-or-less the same experience. Climb up the insides of the 14-metre high tower amidst darkness and with cracks of lights penetrating through the gaps in the outer spiral wall. 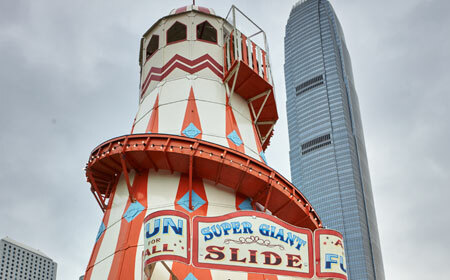 Having reached the top, be greeted with a majestic view over the Fairground, before spiraling back down. Tokens must be purchased from Token Booths around the event site for the Helter Skelter Slide. Take in the sights and sounds of Christmas Wonderland from a charming ride around The Fairground on board the Christmas Train. 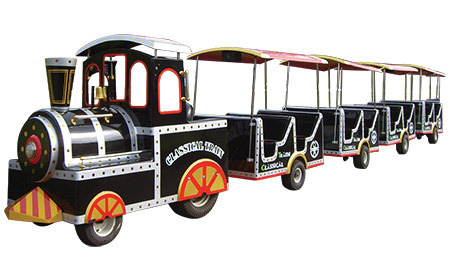 Tokens must be purchased from Token Booths around the event site for the Christmas Train ride. Challenge your family and friends in a good game of chance and skills, including Extreme Basketball, Can Smash 1 and Roll-a-ball at the Carnival Game stalls located at the Fairground (near The Meadow). You might just walk away with attractive prizes including toys from your favourite Disney and Warner Brother characters, such as Baymax, Minions, Winnie the Pooh, Tigger, Drake the Dragon, Paddles the Duck and many more. Tokens must be purchased from Token Booths around the event site for the Carnival Games. Revel in the wonder of ‘snow’ in the tropics with the nightly Blizzard Time set to enthrall all ages at theSpalliera. Also adding to the snowfall line-up this year is the new Fun with Bubbles, located at The Fairground. Be sure to join in the snowy fray and witness the fluffy little flakes or soapy bubbles floating in the air during the two snowfall shows – a beautiful backdrop for family photo memories. More info here. 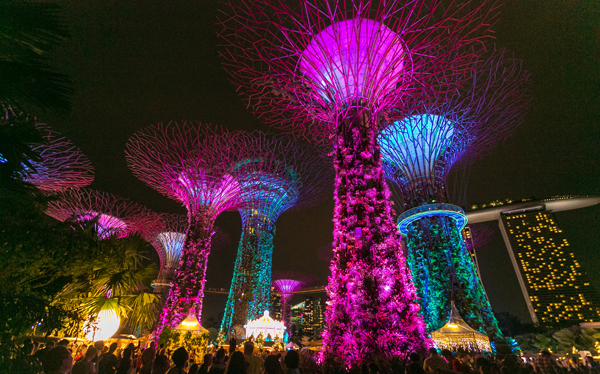 In the evenings, the Supertrees at Gardens by the Bay come to life in a spectacular light and sound show. 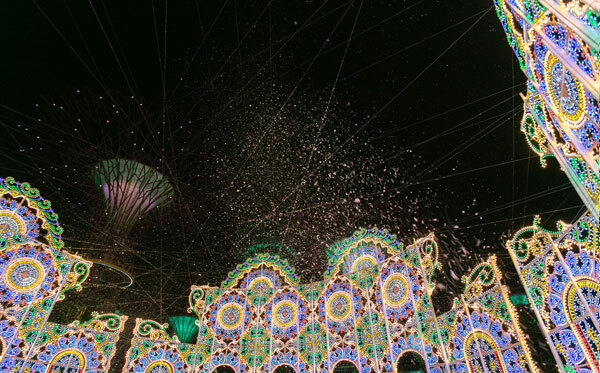 Soak in the beautiful experience of lights dancing in the daily shows! More info here. There are other various programmes and performances such as Yuletide sessions, Theatrical & Magic Shows, Christmas Parades and Christmas Carols held during the period. Visit the Christmas Wonderland’s page for more info. Weave your way around the Supertree Grove, where the charming European-style Festive Market will feature a collection of 19 specially designed wooden huts adapted from renowned Christmas markets throughout Europe, such as those in Hyde Park in London and the Avenue des Champs-élysées in Paris. Shop for one-of-a-kind Christmas gifts such as Luminarie souvenirs, crafts, boutique goods and vintage finds, or indulge in tasty treats and specialty food and beverages, from a traditional Christmas dinner to Mediterranean dishes, European desserts and wines. More information on the Festive Market vendors will be available in the coming weeks. The Festive Market is open from 27 November 2015 to 27 December 2015, 4:00PM to 11:00PM daily. More info on the participating merchants here. Free beverages at The Coffee Bean & Tea Leaf @ Republic Plaza on 13 Apr 2018, 12pm to 2pm.